It's time again for the Fun Friday contest. This week, when you share our FaceBook post your name will be entered into a drawing to win the $25 coupon. The link to the post you need to share is below. Make sure you SHARE it on your FaceBook profile and then post the link from the SHARE in the forum. The contest will close at 12:00 a.m. EST on Monday, March 17th and the winner will receive a $25 coupon. @EricElliott Wow Thank You For Letting Others Know My Story!! Oh, cool. Well I'll participate in this contest then! PS: I also highlighted the post. I've done it! 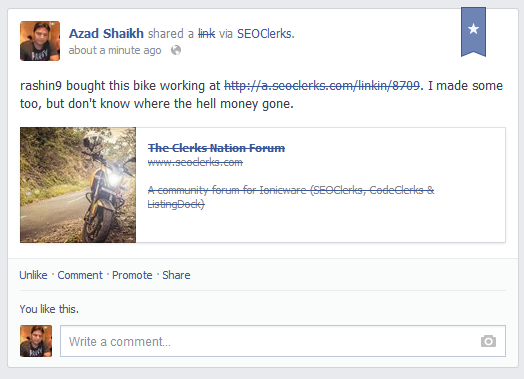 And how I love SEOClerks, it's a pleasure to share it with my friends on my personal page. Congratulations on the new wheels- very nice! I hope I win this one. Post is no longer available for me as well. Yeah can't share the post as well sir. Thanks to everyone for participating in the contest this week. The winner this week is @Logomaster. Congrats and I will send your coupon via private message. yo! The post is not visible :/ why? is it over? Can anybody Provide some guest posting website. ?